My fascination with cars started at an early age. Matchbox cars were diligently arranged in neat rows. No collisions took place for fear of scarring the paintwork. Boxes were carefully stored, a trait I continue to uphold in adult life. A psychologist would read the first paragraph and diagnose Obsessive- compulsive disorder from a pre-school age. I have always fussed over the minutiae. Small details have always been excessively valued. It is probably this fascination for fine details which has fuelled my obsession for haute horology. Ironically for someone with such a predilection for the mechanical, I have no aptitude for the hands-on fettling of oil clad componentry. I love classic cars and admire the sinuous forms adorned with prancing horses on their front wings, but the prospect of getting my hands dirty fills me with a sense of foreboding. I reason my aversion to lifting the bonnet of a car is borne out of a lack of fine motor skills. Yet, some who know me well, will allege it has more to do with my need to keep fingers free of potential contaminants. I have now found the perfect watch which appeals to my fascination with engines and watches, yet does not necessitate getting my hands dirty. 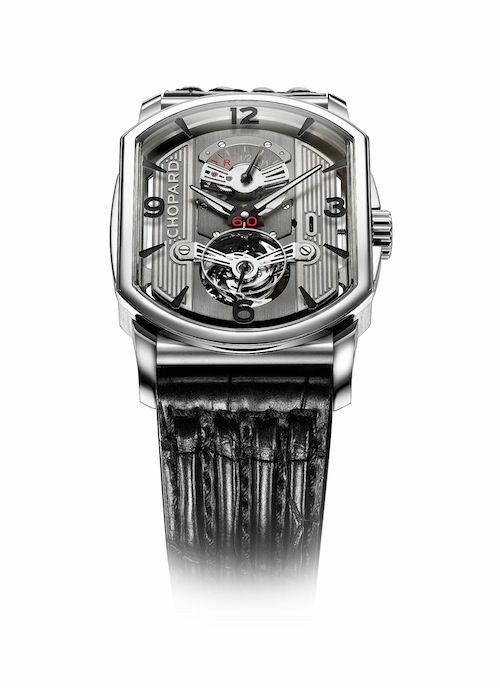 The Chopard L.U.C Engine One Tourbillon draws inspiration from a car engine block. The L.U.C Calibre 04-01-L provides the background for the watch’s functions. It engages inquisitive eyes and draws them ever closer to absorb every detail of its sculpted form. Chopard is a brand that is intrinsically linked to classic cars, sponsoring the iconic Mille Miglia for more than 20 years. Their Co-President, Karl-Friedrich Scheufele, can often be seen behind the wheel of a Porsche or Ferrari of yesteryear beside his good friend and racing legend, Jacky Ickx. 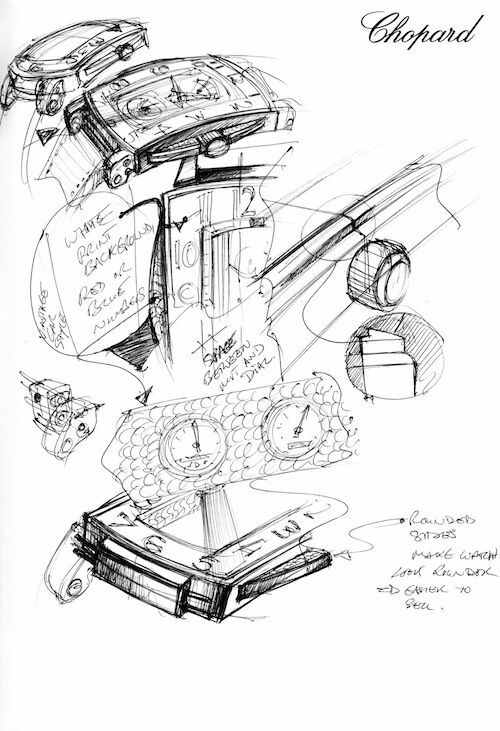 It comes as no surprise to see that Chopard have created an octane inspired timepiece. However, it is the design language which surprises and delights in equal measure. The rear of the main plate provides the canvas for the dial. It resembles an engine block with reamed detail, arranged from north to south. The Chopard name is presented in a manner befitting a car maker. It only needs to add the engine capacity to the right hand bank of the engine and the illusion would be complete. The design is inspired and never fails to captivate with its delightful details. At the northerly aspect of the dial is a power reserve indicator. The information is presented like a fuel gauge, with low power denoted in red. At the southern aspect of the dial is a tourbillon carriage. Arguably a tourbillon adds little to rate keeping in a wristwatch, but that misses the point. 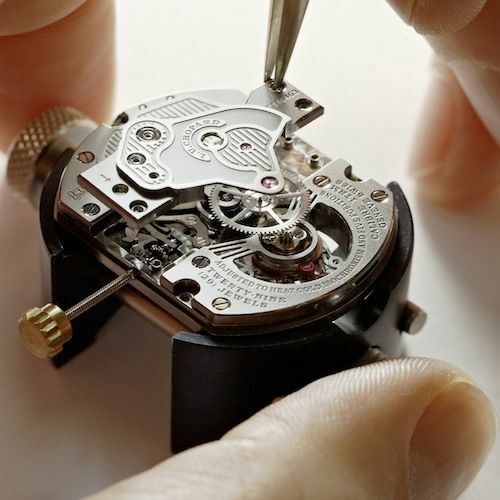 It wonderfully demonstrates the peerless craft of the master watchmaker. Moreover, it would be an inert heart that was not seduced by the spectacle of the whirlwind industriously revolving. Hours are indicated with Arabic numerals at 3, 6, 9 and 12 o’clock. The intervening hours are marked with simple batons. Both numerals and batons are engraved onto the glareproofed sapphire crystal and black tinted to enhance legibility. They appear to float above the engine block. The hours and minutes are indicated with Dauphine fusée hands, a design code in common with other L.U.C models. 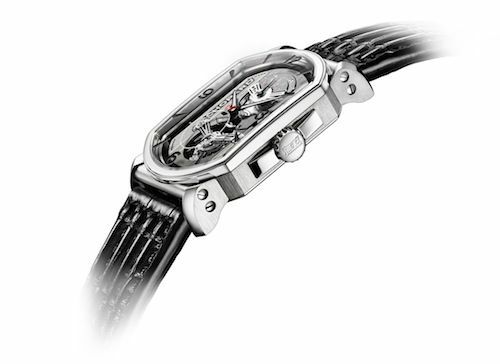 A subsidiary seconds function is located above the tourbillon carriage. One aspect I particularly like, I happened across by accident. I passed the watch in front of a bright light and noticed that the main plate appeared to float within the case. Close examination revealed that it is secured at three points, similar to engine mountings within the case. They are functional, helping to absorb shocks. Yet, it is the aesthetic allure they provide which offers greater appeal. I adore the space provided between the plate and the inner case. It bestows a transparency and honesty which is wonderful to behold. All versions of the watch are limited and presented in titanium. But, it is the version with a brushed / titanium case which appeals to me the most (Ref 168526-3001). It is a limited edition of 150 in recognition of, the, 150th anniversary of Chopard. The case dimensions of 35.4 mm x 44.4 mm are perfectly judged. The crown did not gouge my skin, like some timepieces. The Engine One Tourbillon sat happily on my wrist. I think one reason for the agreeable fusion of wrist and watch is the lug design. They are short, allowing the leather strap to readily cosset the arm in affectionate embrace. Moreover, the strap design is worthy of note. It is hand-sewn alligator leather and has a ribbed design, resembling four reinforced inserts, typical of the seats found in classic racing cars. It is this attention to detail which differentiates this timepiece from the conventional. A sapphire caseback indulges the wearer with another horological vista to savour. The movement is presented in full technicolor splendour. The L.U.C Calibre 04.01-L is a manual wound movement and is entirely designed, developed and produced by Chopard Manufacture. This comes as no surprise to those of us who know a little about the brand. They are vertically-integrated, performing many tasks often outsourced, within the confines of their own organisation. I am an admirer of Côtes de Genève motif and petit perlage and Chopard have demonstrated on other calibres, their ability to master these finishes. However, this watch does not follow traditional convention but presents bridges with a nickel silver finish. Traditionalists should not despair, because the presentation of the movement is peerless and congruent with the contemporary persona of the watch. The reamed detail is repeated on the bridges courtesy of a grained motif. Close examination of wheels reveals circular graining in most instances. However, an aperture at the top of the dial allowed me to note the snailing on one of the wheels. It is the partial disclosure of some of the mechanical mastery of the watch which indulges my horological scopophilia. The shape of the movement emulates the shape of the case, conforming to watchmaking decorum. The accuracy of the watch is guaranteed, courtesy of COSC certification. 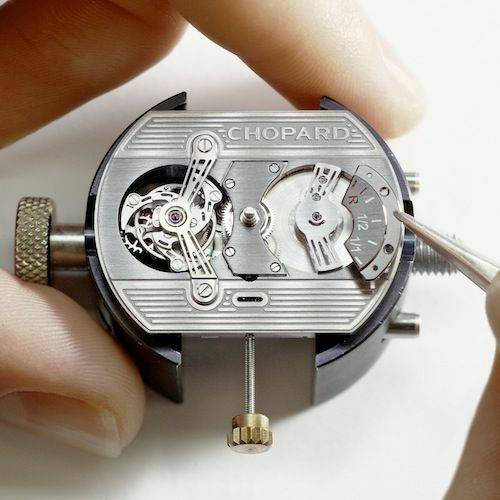 Initially on seeing the Chopard L.U.C Engine One Tourbillon, I was unsure whether it sated my horological propriety. But, a further encounter with it a few weeks later and I fell in love. I think it is the honesty of the watch. It does not hide its heart behind a polished veneer. It bears its soul and indulges the wearer with a view of its mechanical intellect. Moreover, Chopard have not sought to emulate others but chosen its own path to excellence with an original offer. The Chopard L.U.C Engine One Tourbillon wonderfully demonstrates the elevated competence of Chopard L.U.C. 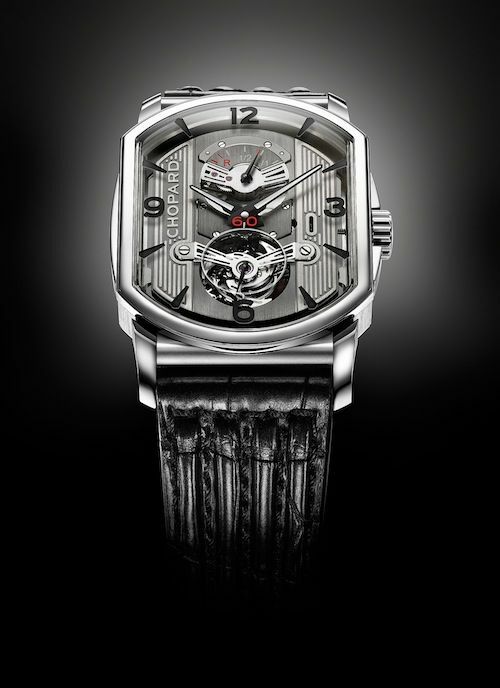 Furthermore, the brand from Geneva perfectly shows it has a profound creative ability with this innovative timepiece. This watch indulges my thirst for the mechanical, yet, It allows me to quaff every delight it proffers, without ever soiling my unsullied hands. Case: Titanium; dimensions 44.40 mm x 35.40 mm; height 10.90 mm; water resistant to 5 bar (50 metres); sapphire crystal to the front and caseback. 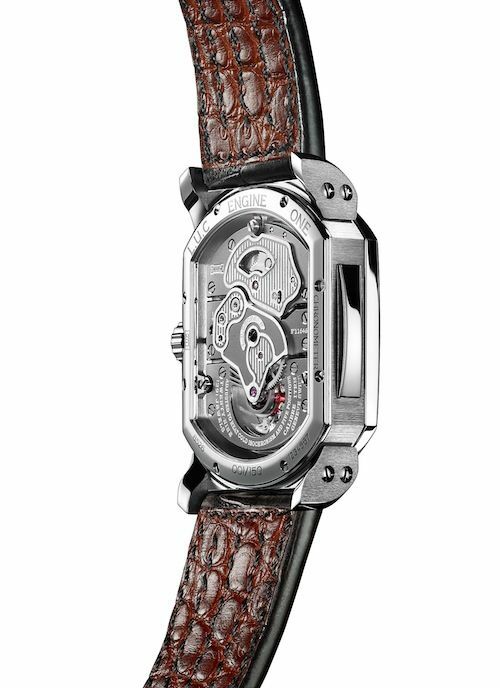 Movement: L.U.C 04.01-L; hand-wound movement; frequency 28,800 vph (4 Hz); 29 jewels; 60 hours power reserve. Strap: Hand-sewn black alligator leather strap, lined with brown alligator leather and supplied on titanium pin buckle.